A decade of “Dining Out” — been there, ate that, lived to write about it. What I found was not only a retrospective of my work, but an overview of Seattle’s restaurant scenery during the last decade. It was surprising to see what’s changed since I first started chronicling restaurants for the Dining Out issue, but even more so to note what hasn’t. Back in 1999, readers were just getting to know me and my taste in food, explored in “Secret Loves of a Restaurant Critic” — which, in this critic’s case, meant a tour of the city’s many ethnic restaurants. Something I’ve expounded upon again and again and again in the years since. 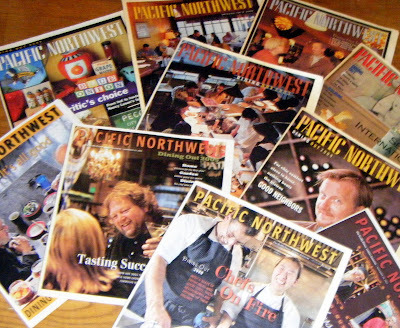 Among the 25 or so mentioned in my first Pacific cover story, I was delighted to note that only a handful had closed in the years since. One of them, sadly, was the Russian restaurant Kaleenka. But I wasn’t sad about it for too long, because that darling cafe had morphed into something even better: Le Pichet. Le Pichet was included in the 2000 issue, in which I offered strategies for “Making the Most of Your Dining Dollars” — Dot-com bubble-bursting ideas that would be more than useful in today’s free-falling economy. I suggested readers “Belly up to the Bargains” by dining at wine bars or taking advantage of early-bird and other discounts, encouraged them to “Eat the World” (see: 1999 cover-story) and published a list of great restaurants (from cheap eats to ‘spensive) that I felt were an excellent value for your devalued buck. “Leson’s List” (2002) was great fun because it allowed me to answer the oft-asked question, “What’s your favorite restaurant?” In it, I listed my “Top Ten” as well as 25 others — from fancy to not-so. It’s a snapshot in time for sure, and I’d make a few tweaks if I had it to do over today (switching out Lynnwood’s Matsu Sushi for Taka Sushi, for one). Funnily enough, out of those 35 restaurants, only one has closed, so I’m clearly not the only diner who considered those restaurants “tops” — then, or now. Bon Appetit magazine recently named Tom Douglas Culinary Entrepreneur of the Year and I said as much in 2005. Which explains why he’s seen hoisting a martini on the Dining Out cover as the poster-boy for “By Popular Demand” — my tale of the many entrepreneurial locals who once owned a single restaurant and have since taken off with their successful business models. In the 2005 issue I gave a shout out to many successful entrepreneurs, including the folks at Than Brothers (one of the first Vietnamese pho houses to venture beyond the confines of the International District) and restaurateurs Peter Levy and Jeremy Hardy of Chow Foods restaurants, who started with the gone-but-not-forgotten Beeliner Diner and now own six happening joints. Today I’d have to add several others to that list, including Ethan Stowell (his fourth restaurant, Anchovies & Olives, is set to open any minute) and the the guys from Blue C Sushi (who’ve since opened Boom Noodle and recently debuted their fourth Blue C at Westfield Southcenter Mall). Speaking of getting started, the genesis of that story regarding those six degrees of separation of Seattle restaurants, for me at least, goes back 15 years to 1993 when I annotated a “family tree” of Italian restaurants for Seattle Weekly. It continued as I watched — and wrote about — the many chefs launched by Tom Douglas. During the 30-plus hours of phone interviews I did to report that story, I was impressed by how many of the teller’s tales overlapped, with each one filling in color the others had forgotten — or purposely left out. Those conversations brought a slice of Seattle-restaurant life home for me in a very intimate way. It’s the intimacy of the restaurant experience that I find fascinating, on every level. Sometimes, it’s hard for me to believe I’ve been writing about restaurants for almost as long as I spent waiting tables. But these days I can look back on a career that spans more than 30 years — one that can be balanced between the “before” (waitressing) and the “after” (writing). And having spent so much time late this summer in the kitchens of some of our city’s most talented chefs (I even waited tables at The Corson Building the night Genevieve Alvarez filmed this video), I was reminded that no matter what “lens” I might be looking through in order to capture it, I love the ever-changing dynamics of the restaurant business.